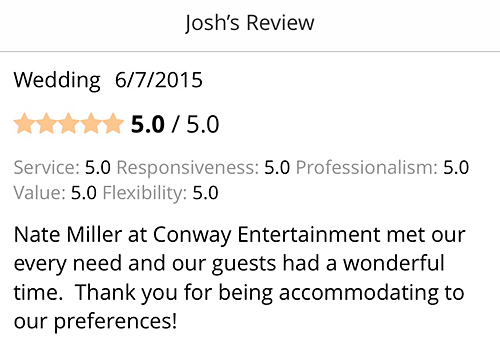 Nate Miller has been a huge asset to the company. He performs an average of 95 events per year. His schedule books up long in advance and if you’ve seen Nate perform you’ll know why. 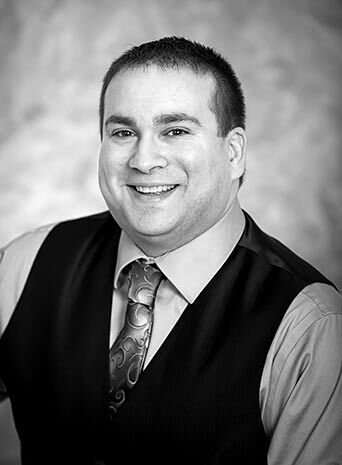 If you’re looking for an exciting and experienced entertainer, Nate is the performer for you. Nate has been performing since 2000, quickly worked his way up the ladder and is now one of the most requested DJ’s in the company. 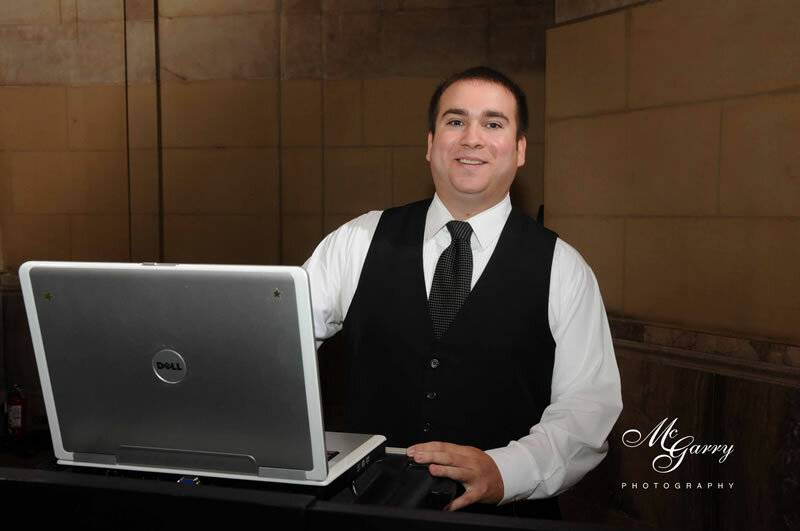 He specializes in weddings and knows the importance of taking care of his clients. He constantly pays attention to all the details to make sure that everything runs smoothly and according to your plans. 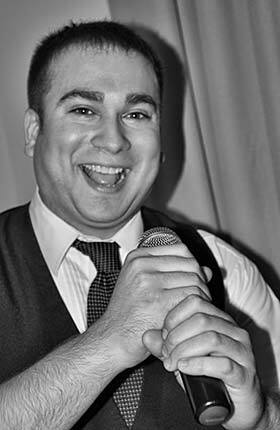 Nate is an exceptional, outgoing performer, but realizes the focus of the evening should be on the guest(s) of honor. The best way to sum up his performance is outstanding! Let me get to the important part first. Piano Man and more specifically our DJ Nate nailed it. 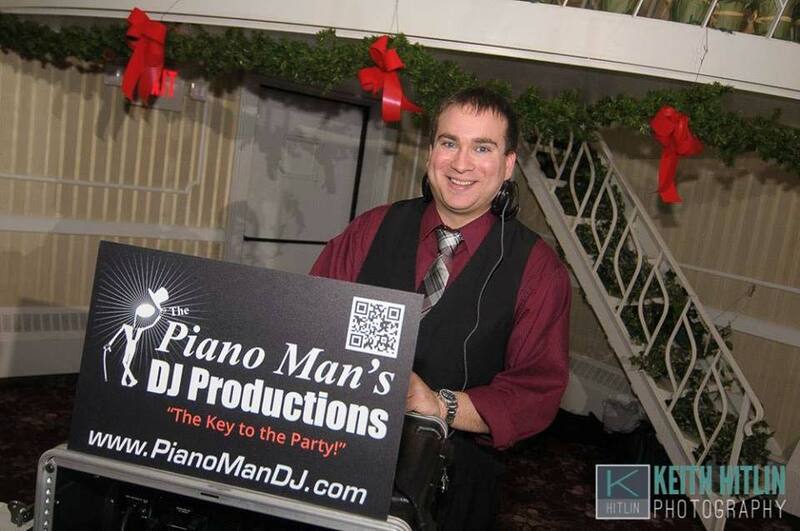 From the first time we started working with Piano Man, we knew we were in good hands. They were professional in all aspects, while remaining personal. 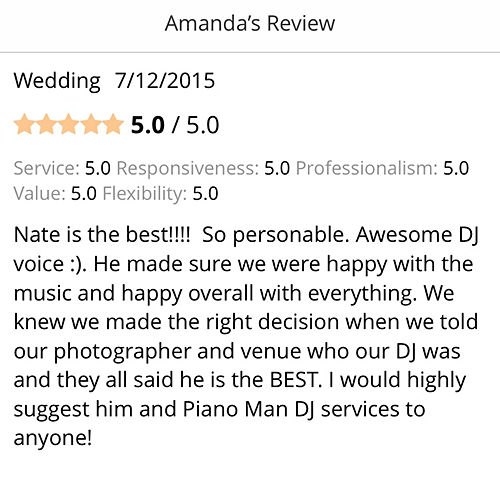 Upon meeting our DJ Nate and discussing what we’d like, we got the distinct impression that he knew how to deliver what we wanted. He listened to our ideas, gave great suggestions, and helped us better define the sound we wanted. To be honest, I figured we’d be disappointed given the high bar we mentally set after our meeting with Nate. We were not disappointed in the slightest. The night of, Nate kept the energy of the party at the appropriate level, be it introductions, dinner or dancing. 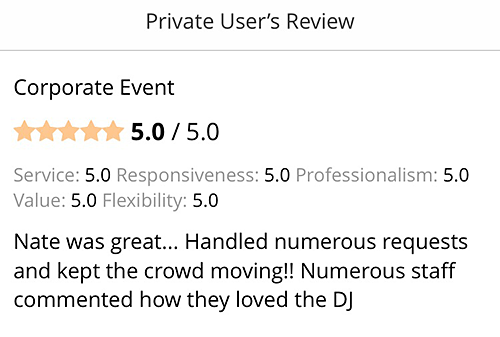 Both an excellent MC and DJ, we have heard nothing but rave reviews from our guests, including one aunt who only retired from dancing due to leg cramps. Every generation was represented on the dance floor. When requests for music outside of our initial direction came, Nate solicited our approval, but did not bombard us with stupid requests – and everything that he brought we were all for. 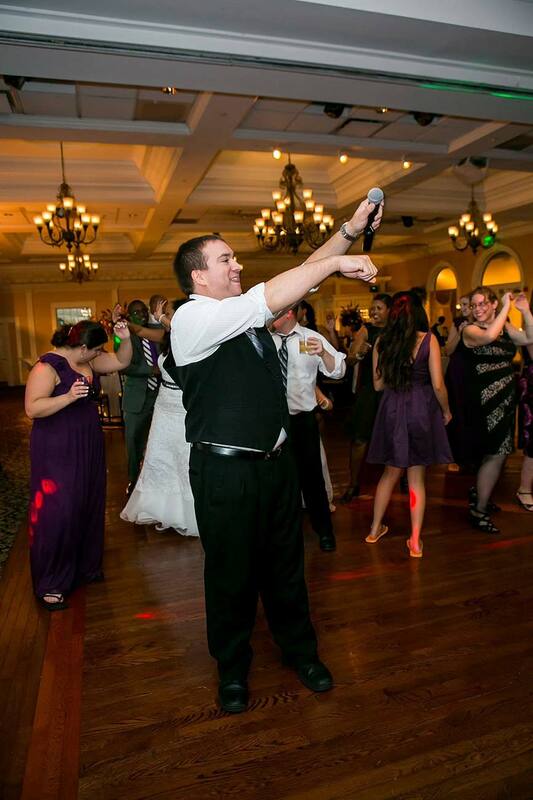 I have no doubts that much of our reception’s success was due to Piano Man and Nate. 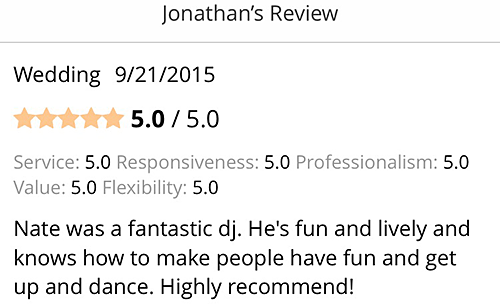 Our thanks go out to them and if anybody is looking for a DJ, they would be our first recommendation. 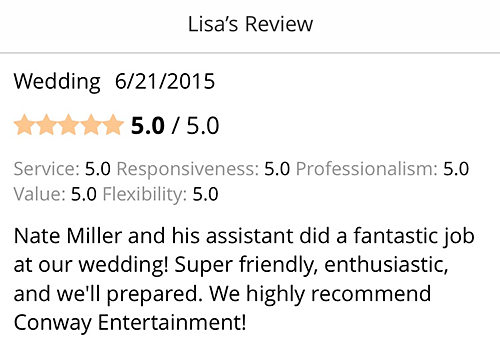 We are so pleased with the professionalism, responsiveness, and the great personality that was provided to make our wedding amazing!!! 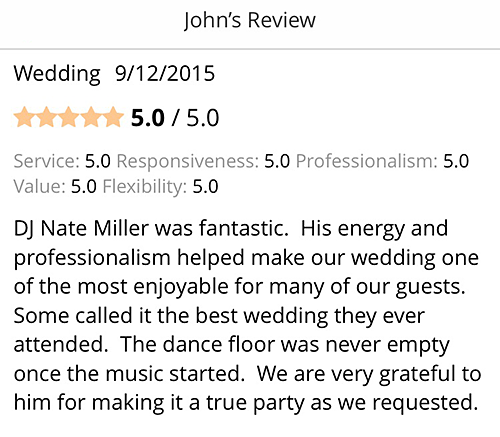 Nate’s energy, efficiency, and overall enthusiasm helped make our day perfect!!! 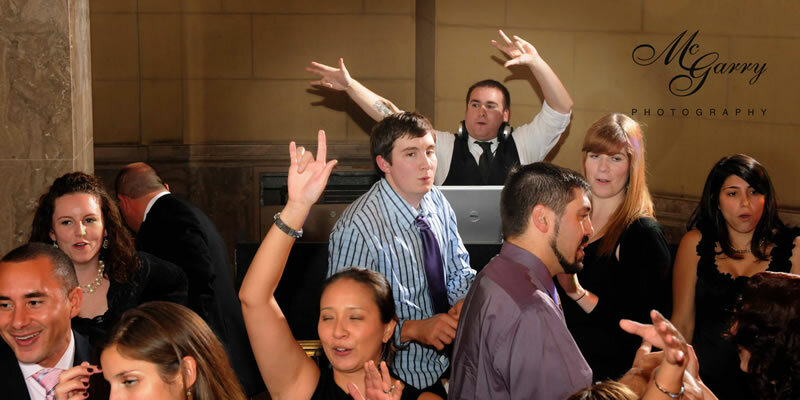 We had Nate for our DJ for our wedding. He was great, I would highly recommend him. He was completely open to the music we wanted to play (I provided him about 1.5-2 hours worth of specific songs we wanted, and then gave him the type of music at other times), and his choices outside of the music we specified were spot on. He was great about tracking down some of our less mainstream music, and checked in with us often during the night to keep a constant pulse on how we were enjoying the music, if we wanted to pivot on the type of music, etc. Nate was awesome. He was very professional and kept the dance floor going all night. He played a wide variety of music that was enjoyable to everyone and he was very timely and clear with his announcements. There were several times that he would check in with us to ensure we were happy with the music and to see if we needed or wanted anything else. He also made us feel like he was our one of our friends, so it made interacting with him so easy throughout the night. 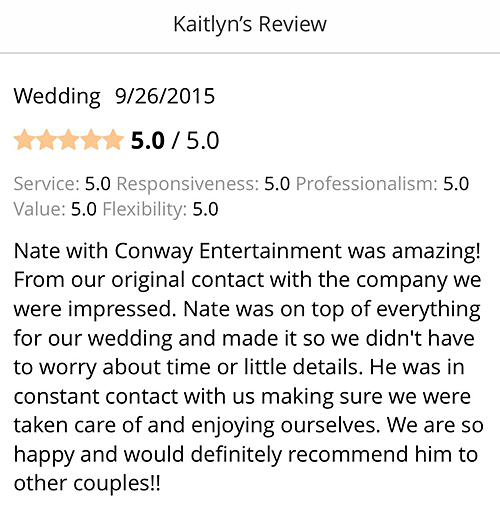 I would definitely recommended Nate to any one!! Thank you Thank you Thank you!!!! Our wedding was beautiful and so much fun… we really appreciate all of your help in picking a photographer and for making our day an awesome one!! You are really the best!! 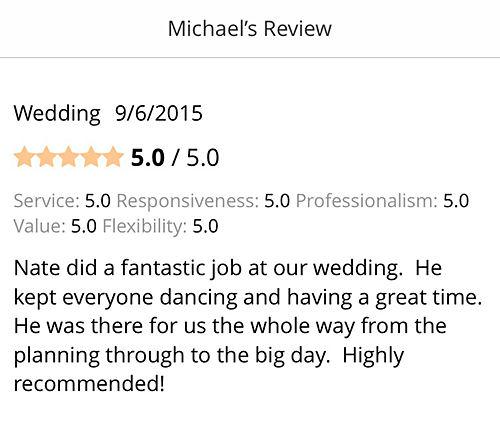 Nate was so helpful and extremely easy to work with… felt like we knew him all our lives!! Everyone was commenting on how great a time they had and how many smiles were on everyone’s faces. Excellent job Nate!! Exceptional service, professional but also very personal!! Thanks so much!! Nate was wonderful. He gave us suggestions on how to keep the party going and he really knew what he was doing! We had a great reception and lots of great memories to share!! Thank you!!!! Everything he played was great, it was like he read our minds! Both our family and friends were happy with the music which is a hard thing to do! 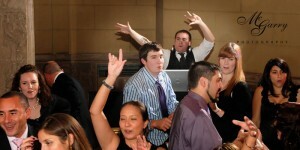 Everyone came up to me at the reception and told me how great the DJ was. Nate’s ability to keep a pulse on the kids’ (and adults’) level of activity and interest was very intuitive. Nate contacted us to remind us to start thinking about music, etc., which I appreciated. For as busy as Nate was during the event, he was very accessible for questions, requests, ideas. And his questions directed to myself or Hannah didn’t seem intrusive. He was there when we needed him. We had a blast and he read the crowd perfectly. We had about 30-40 people out on the dance floor all night long! It was the best wedding ever and it was MINE!! He was a great guy and tell him we will be a reference for him anytime! We think he enjoyed himself as well! Thanks again Diana for all of your help! We just wanted to send you a quick note to thank you for the great job you did! Everyone keeps emailing us to tell us what a great time they had. 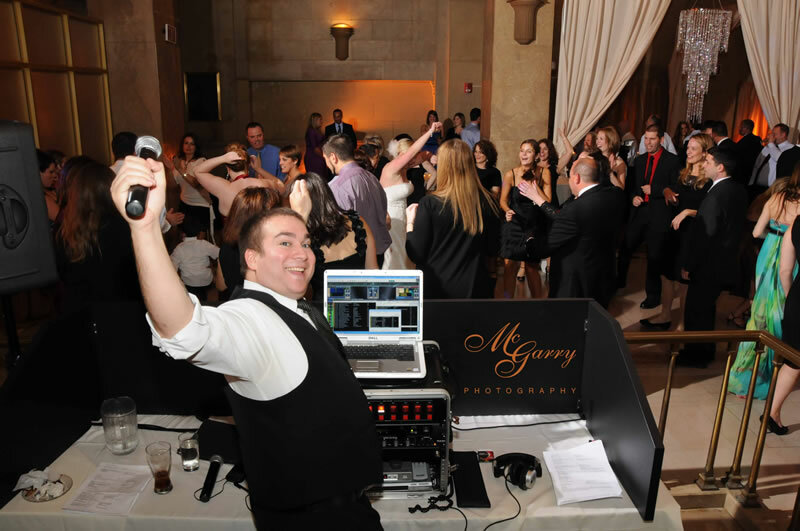 You had everyone up and dancing, smiles all around….it was a great time. 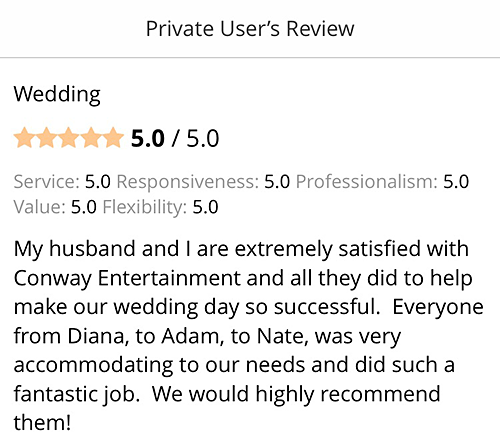 Well, you have two happy customers here, and that is the best type of advertising, because, we’ll tell anyone who wants to listen what a great job you did at our wedding. I would like to thank you for the excellent DJ service at my daughter’s wedding. The reception was for Sara Hitchcock/Jonathan Miller at the Edison Club on August 19. Nate played a variety of music for all ages and were very professional. I received numerous compliments from our guests, and I thought I’d pass that along. We will definitely recommend your company to friends and family in the future. 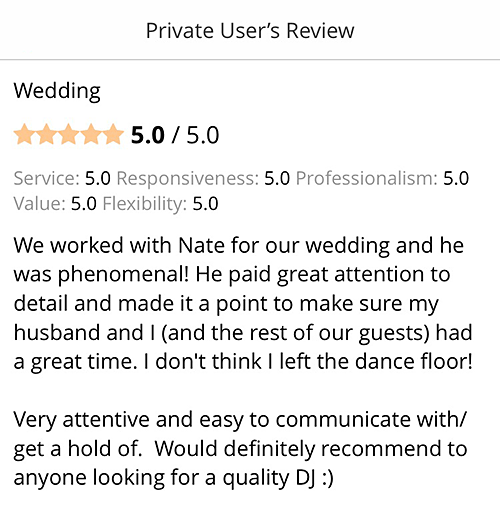 Nate did such a great job at letting us know ahead of time what was going on with the itinerary so that everything would run smoothly, yet we still had plenty of time to spend with our guests. Also all of our requests were carried through. 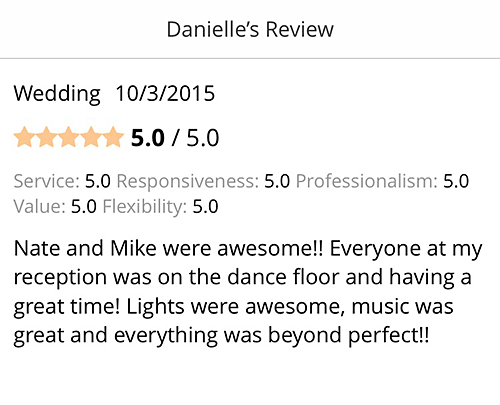 Our guests definitely had a great time. 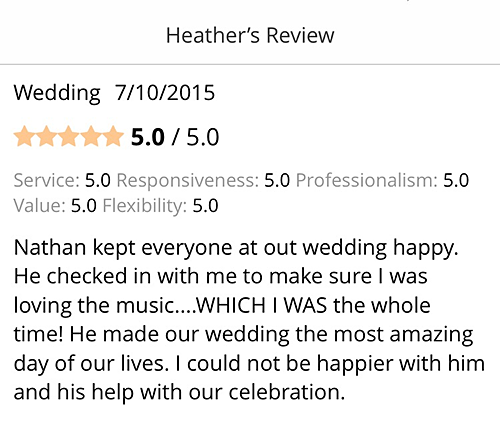 We had so many phone calls after the wedding from our guests telling us what a great time they had. The music was great. The dance floor was packed the whole night. We would like to thank you for your excellent service. 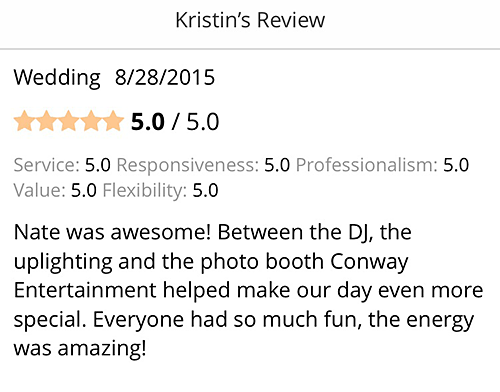 Not only did our guests have a wonderful time, but we did as well. It was great to see all of our friends and family having so much fun celebrating our wedding with us. Thank you so much! Request information below or call (800) 882-7216.